The Burgman Street, which is inspired by its European cousin, the Burgman range of scooters, is modelled to be bulbous yet well-sculpted. Its design is likely to attract both mature and young buyers alike. The front apron features an LED headlamp with clear lens indicators on either side. It also has a flyscreen covering the instrument console, which should prove its worth at high speeds by deflecting windblast. The wide single-piece seat (780mm high) ends with large grab rails and a tail light at the end. Suzuki has designed a dual-tone exhaust that acts as a cover for the existing exhaust, rather than redesigning the entire unit. Weighing in at 108kg, the Burgman is rather light and only 7 kgs heavier than the Access. The Gixxer-derived full-digital instrument console displays the essentials – speed, fuel level, dual trip distances, odometer readings and time. Moreover, the scooter also gets a nifty oil change indicator apart from other warning lights. Right behind the apron sits two cubby holes on either side of the steering rack, which can easily accommodate your phone, wallet and a 1-ltr bottle of water. Also, the one on the left gets a provision for an optional DC socket. There are footboards placed on the front apron which enables the rider to outstretch one's legs for a laid-back riding stance. The generous 21.5-litre underseat storage is almost the same as the Access and can accommodate a half-face helmet with ease. However, a full-face helmet, especially a branded one, may not fit. Unlike TVS’ NTorq, the Burgman Street misses an underseat storage light. Even though the seat can be opened from the ignition itself, the rider will have to step off the scooter to access the fuel filler cap. Additionally, customers can opt for a pillion footboard, chrome rear view mirrors and a USB charger. Powering the Burgman Street is the same 124.3cc, air-cooled, single-cylinder motor seen on the Access 125. This engine churns out 8.7PS of power and 10.2Nm of torque. 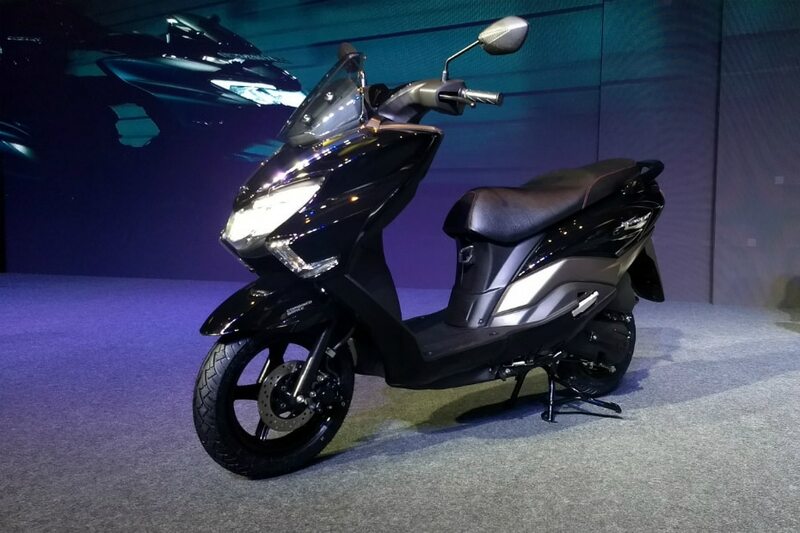 The company-claimed mileage for the scooter is 53.5kmpl, which translates to an approximate range of 300km thanks to the 5.6-litre fuel tank. Regular service interval is at every 3,000km, same as the Access 125. The Burgman’s underpinnings include telescopic front forks and a single monoshock unit at the rear. Braking duties are taken care of by a single disc brake at the front and a drum unit at the rear. Suzuki’s Combined Brake System (CBS) comes as standard. In essence, the system enables you to operate both brakes by applying pressure on just the rear lever. But for optimal braking, every two-wheeler company suggest using both the brakes simultaneously. The scooter gets a 12-inch front alloy and a 10-inch unit at the rear, wrapped with 90-section MRF Nylogrip Zapper tubeless tyres. Suzuki offers the Burgman Street in three colours: Pearl Mirage White, Metallic Matt Fibroin Gray and Glass Sparkle Black. The Burgman Street is positioned as a premium scooter above the Access 125. Priced at Rs 68,000 ex-showroom, it rivals the Honda Grazia (Rs 63,994), Honda Activa 125 (Rs 64,007), Aprilia SR 125 (Rs 66,764), TVS NTorq (Rs 59,687) and Vespa LX 125 (Rs 72,787, all ex-showroom Delhi).